Sorry for the misinformation you may have gathered about Christianity. The Bible, the book you referred to, wasn’t written by a man, per say. It was a record of many men, and their relationship with God, over the course of many thousands of years. They were inspired by Holy Spirit to write how God chose a group of people, called the Israelites, to reveal Himself to the world as a loving, yet just God.I agree that SOME people are religious, and can be controlling, but a true, intimate relationship with the only LIVING GOD, YESHUA (the Jewish/Hebrew name for Jesus) is anything BUT controlling. That’s what free-will is all about. We choose if we believe or not, but by EXPERIENCING Him as real, not by what we’ve experienced through faulty human beings, who may know of Him, but don’t really have an intimate relationship with Him. We hear and read His words in Holy Scripture as a GUIDELINE for living, that will be in our best interest, AND FOR HIS GLORY, yet we get to make a choice to have life, by FAITH (without actually seeing, yet believing), or to choose death, following our own self-focused path of often misguided enlightenment that ends in a death without the promise of eternal salvation. God/Jesus/Holy Spirit is three distinct personalities within ONE uncreated being. Men, called Prophets, prophesied about Jesus, thousands of years before He humbly came to earth as a baby, born of lowly birth, though heir to a kingdom NOT OF THIS WORLD. Jesus’ name is also described as Immanuel, which means “God with us,” and called Yeshua in Hebrew which is derived from “to rescue”, “to deliver,” or “to save.” He is the Messiah (http://www.gotquestions.org/what-does-Messiah-mean.html) spoken about in ancient scripture. The key is that He became a sacrifice, on the cross of crucifixion (an agonizing horrible death practiced in the first century), for all mankind, past present, and future, to make a way for us to be with Him in eternity. His resurrection (three days later), from that death and burial in a grave, is proof He is who He says He is. He is ALIVE! That’s what Easter was originally about, first called Passover or Resurrection Sunday. Today the celebration has been commercialized with bunnies, chicks, candy and hunting for eggs to promote retail sales. However, only true believers in Messiah understand the significance of the life example of Jesus. Though many of us (myself included) have been hurt by over-zealous, or even hypocritical Christians in the past, that doesn’t mean God is like that. It also doesn’t mean there aren’t REAL, GENUINE lovers of Jesus who actually live what they preach. I’m praying you give the One True God a chance, and experience authentic life-changing hope in Him. 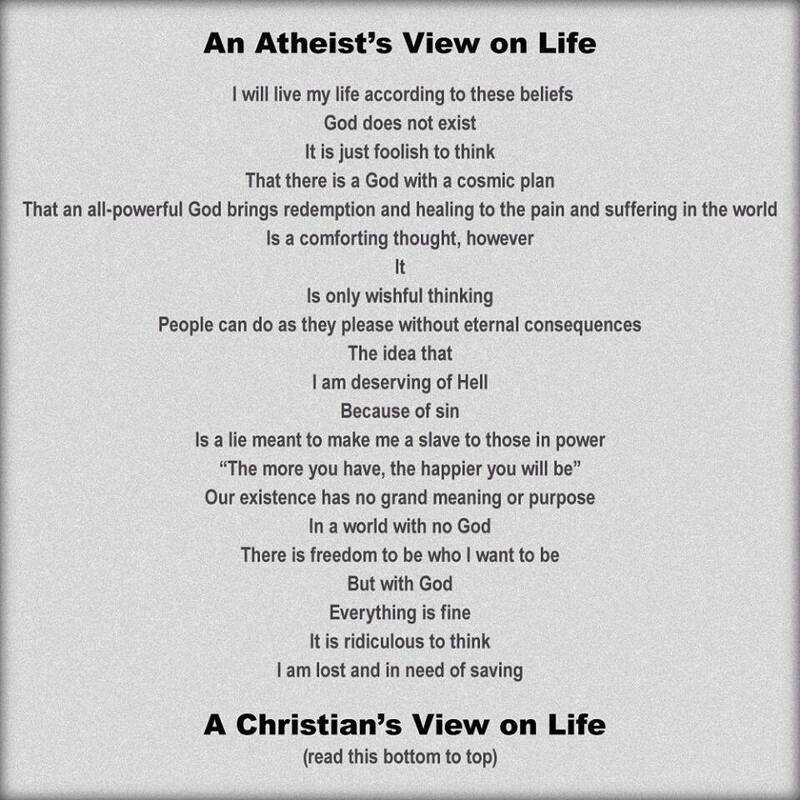 This entry was posted in Spiritual and tagged atheism, atheist vs. God Believer, Christianity, Faith in God vs. Faith in Self. Bookmark the permalink.